The Leonhard Recreation Center was venue for the 2016 Midwest Collegiate Judo Championships on March 13, 2016. The tournament was hosted by the University of Illinois (Illini) Judo Club. 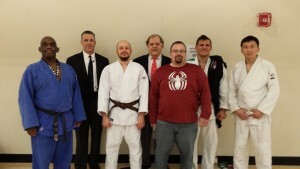 This tournament saw the officiating and White Dragon Judo Club debut of Bryan Enlow. Bryan makes his return to the mat after a 12 year hiatus. Derick Wellman and Randy Pierce were also among the 16 referees assigned to this tournament. Demonn Smith was the player/coach for Team White Dragon. The team was poised for a great showing in the first regional judo championship of the year. Jay Baker got off to a great start advancing to the quarterfinals in his division but later lost the momentum and failed to medal in this event. Bat Unur “The Batman” Erdenebayer competed in the lightweight division and failed to make to the medal podium. Demonn Smith took bronze in the super heavyweight division. Adnan Gutic showed great perseverance and determination going 5-1 on the day and scoring his first gold medal of the year.